Joshua Tree National Park is an awe-inspiring 800,000-acre landscape that gets its name from the beautiful Joshua Trees that dot the Mojave and Colorado deserts. The east side of the park is dominated by the lowland Colorado desert that is known for its spiky bushes and prickly cacti. The west side contains the highland Mojave Desert that is home to most of the parks Joshua Trees. This popular park has developed over 9,000 rock climbing routes, making it the largest climbing park in the world. There are eight campgrounds in the park, with six of them residing within a 10-mile radius just inland from the Northwest corner. All the campgrounds have some form of toilet facilities, but no running water. Don’t forget that you are in the desert, so bring extra water just to be safe! 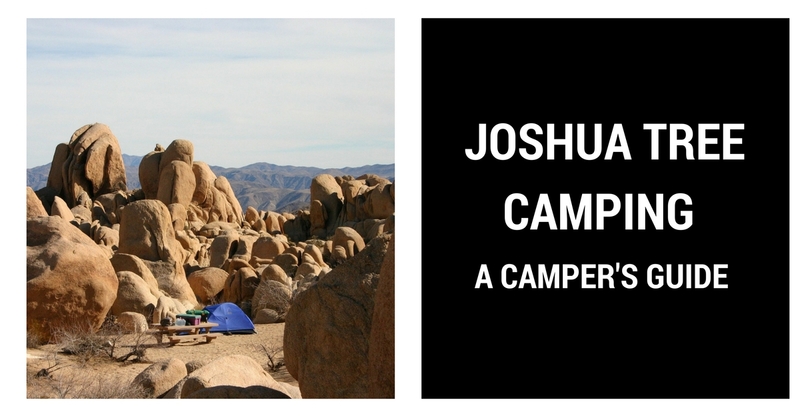 Here is my comprehensive list of the 5 best campgrounds in Joshua Tree. The Indian Cove Campground is in the northwest section of the park directly in the middle of the North, and West entrances. You will drive along a long dirt road for about two miles to reach the campground where there are 101 individual campsites and 13 tent-only group sites. The campsites at this location are right against some of the best bouldering rocks around. You will spend hours hopping around these boulders and finding unique 360 views of boulder formations and desert landscapes stretching as far as the eye can see. The best part of camping at Indian Cove is being close to the hiking trails. Halfway down the dirt road that leads to the campground is the famous Boy Scout Trail, that stretches 8 miles (one way) to the trailhead along Park Boulevard. If you don’t want to hike 16 miles, you can drive to the Fortynine Palms Oasis, and enjoy the leisurely 3-mile (one way) hike to a beautiful oasis in the middle of the Mojave. Hidden Valley is located along Park Boulevard, 5 miles directly south of Indian Cove in the northwest section of the National Park. This campground has 44 sites that can hold a maximum of 6 people each. The best activities near the campground are hiking to Barker Dam, and Keys View. Barker Dam is located 2.5 miles east of the campground and the lack of elevation change makes this an easy hike. If you don’t mind a long hike, then you should hike the five miles to Keys View, which is the highest point in the park and has wonderful views of the Coachella valley below. Double Cross, part of The Old Woman formation, is the most popular climbing route in the park and is located across the street from the campground parking lot. This makes this campground very popular and reservations should be made ahead of time. Watch this video to see if climbing Double Cross is right for you! Jumbo Rocks campground is located 5 miles east of hidden valley. This campground has 124 individual sites and does not accommodate large groups. Rock climbing is by far the best activity in this area. After all, they don’t call it Jumbo Rocks for nothing! The popular routes near this campground are Conan’s Corridor, Sky King, Nuclear Reactor, and Zebra cliffs. After a long day of climbing, you can amble through any one of the six hiking trails nearby. This park has the most outdoor activities near the campground. If you want to climb as many rocks and hike as many trails as possible, then this is the campground for you. Ryan Campground is located about a mile south of Hidden Valley. This campground has 33 sites that are available on a first come first serve basis. This hike made the list because it’s so close to all of the same adventures as Hidden Valley, but it also lays in the direct path of the 36.5 mile California Riding and Hiking Trail. This is the premier hiking trail in Joshua Tree National Park, and everyone who travels to this area should day hike along this route! Cottonwood Spring is the only campground in the Southern half of the park and is also the Easternmost campground in Joshua Tree National Park. Cottonwood Spring is the one campground in the park that has running water, but you should still bring plenty just in case. This campground has 62 sites and is surrounded by lowland deserts with very little rock climbing available. This campground made the list because it has endless hiking trails that would take more than just a weekend trip to complete. Cottonwood Spring is within four miles of Bajada Nature Trail, Lost Palms Oasis, Eagle Mountain, Pinkham Canyon Road, and the Cottonwood Mountains.